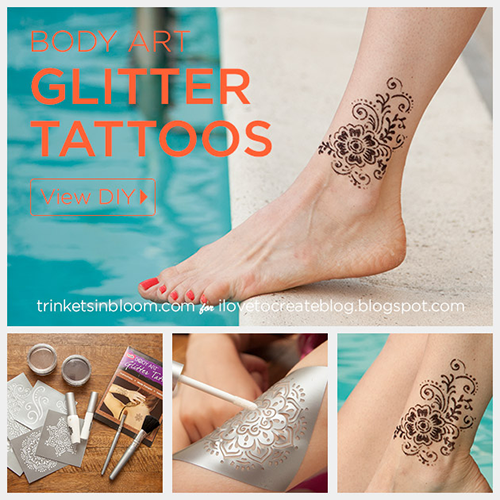 In the summer our wardrobes often get simplified to just the basics, but with these fun henna inspired Body Art Glitter Tattoo’s you can still add some fun sparkle to whatever you wear. 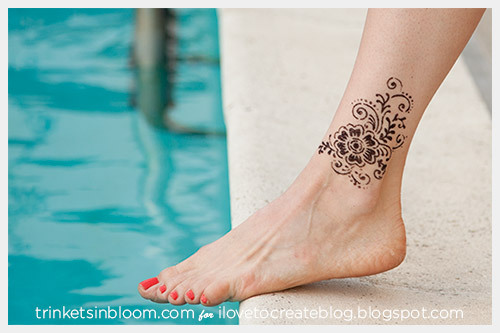 Even your teeny bikini can be accessorized with these sparkly tattoos! They’re super fun and quick to do, so let’s get started! Decide where you want to your tattoo. 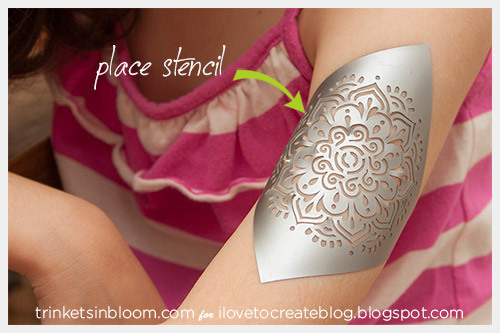 Peel the silver stencil off of the backing and place it where you want it. Be sure to smooth it out so that it is flat on your skin. As you can see in this pic the stencils are very sticky so that you can use them on even a small arm or not so flat place. 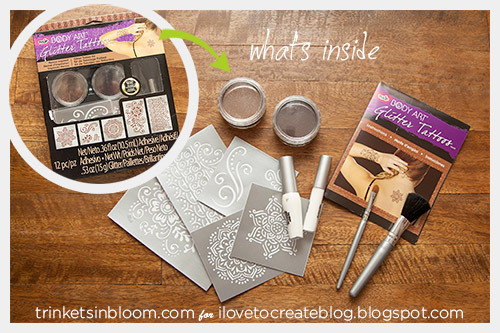 Use the adhesive to fill in the stencil where you will put the glitter. This adhesive is similar to the glue used to attach false eyelashes, it is cosmetic quality. 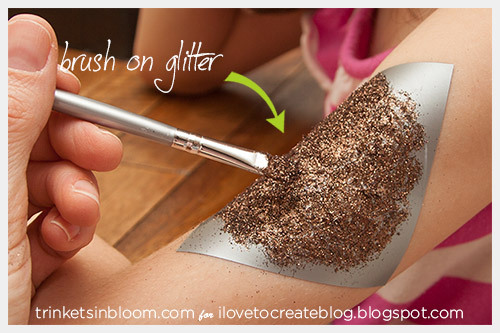 Using the smaller brush add the glitter. This kit is henna inspired so the two colors you get in this kit are reddish browns, one lighter and one darker closer to a black. When you’ve added all your glitter carefully peel off the stencil sticker. 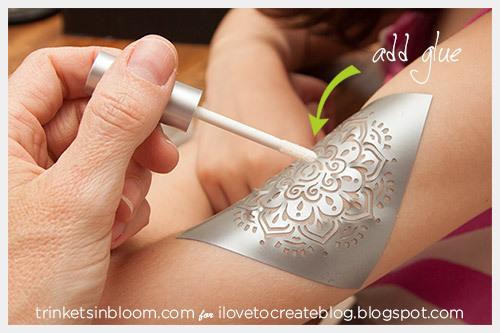 It’s like peeling off a bandaid, but I don’t recommend doing it super fast only because of the small details in the stencil you don’t want to tear it so you can use it again. 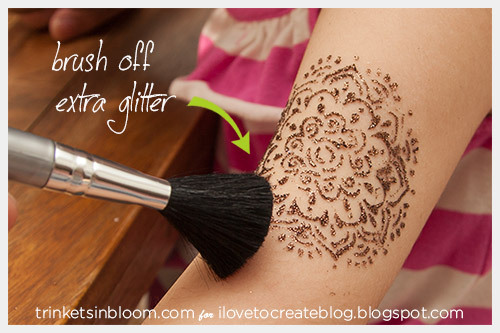 Using the larger brush dust off any excess glitter. While these tattoos are temporary they will stay on for a few days as long as you don’t scrub them with a wash cloth. But if necessary you can remove them with alcohol. For more fun summer fashion DIY’s check out my blog Trinkets in Bloom! Even thro your pic show feet in water, I take it they are not waterproof. are a great, family-friendly way to get loved ones together to spend a pleasant evening socializing and making each other more beautiful. sunitas cheap threading salon is a hair removal technique that uses 100% cotton thread.